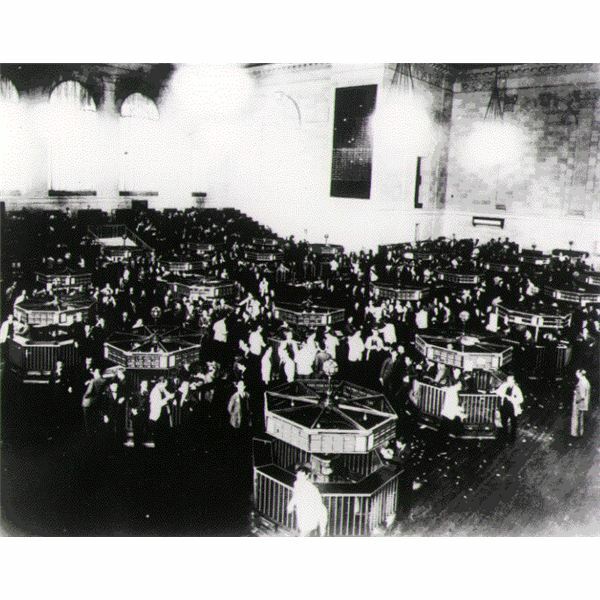 On 29 October 1929, the US stock market crashed. The day became forever after known as "Black Tuesday" The so-called "Great Crash" is known by a a variety of monikers including the "Wall Street Crash of 1929" and the "Stock Market Crash of 1929". It marked the beginning of the Great Depression, a ten-year financial crisis that left the US and the world in desperate straits. It was the biggest financial crisis of the 20th century: Over $16 billion was lost in October 1929, a fact that threw the entire US economy into disarray. Over 40 percent of all banks (approximately 10,000) failed in the next two years, resulting in losses of over $2 billion. Stocks were devalued by more than 80 percent. Unemployment went up to almost 25 percent. These Stock Market Crash 1929 facts define the parameters of the event. The years leading up to "Black Tuesday" were referred to as the "Roaring Twenties." The country was filled with optimism and people made money hand over fist. It was a time of wealth and excess. A famous economist of the time, Irving Fisher, was recorded as saying, "Stock prices have reached what looks like a permanently high plateau." It was a bull market, meaning that stock prices were higher than what their true value would indicate. In the week prior to "Black Tuesday", the US stock market was highly unstable. Stock prices rose and fell wildly, surging one minute and ebbing dramatically the next. Periods of high selling were matched with periods of high buying, and the volume of both was significant. On "Black Tuesday", over 16 million shares were traded, a record that was not broken until 1968 (when there were more significantly more shares on the market). The stock market began a slide in value on "Black Tuesday"; in total, the stock market declined by 89 percent over the course of the next three years. This crash came on the end of a period of intense speculation. Not only was speculation heavy in the stock market itself, to the point that people would borrow money to buy stocks, but brokers would lend smaller investors more than 66 percent of the value of the stocks they purchased. More and more people borrowed and invested. At one point, over $8.5 billion was on loan, a number far exceeding the amount of currency in circulation at the time. The stock market had been rapidly escalating in value since 3 September 1928. When on 24 October 1929 the stock market began to decline under that 3 September peak, financial crisis and economic chaos ensued. So many people moved to sell stock that stock shares were rapidly devalued. There was at the time, no mechanism for government intervention in the financial markets. The government was very small and tended to not intervene in economic issues as the USA had operated under an economic philosophy of Classical Liberalism up to this point in history. The decline in the stock market resulted in the inability of investors to repay their loans. This default in the financial markets is what had such a butterfly effect on the economy, since the losses of the 16 percent of US households were invested in the stock market would not by themselves have wreaked such economic choas. Banks went under and millions lost all of thier deposits. Many companies went bankrupt. Access to credit was limited and people lost their jobs until over 25 percent of American adults were unemployed. In turn, consumer spending was depressed. As a result, companies received less revenue, people were laid off, and, eventually, those companies too went bankrupt. Many nations took steps to protect thier domestic industries during the crash. The USA passed the Smoot-Hawley Act which heavily taxed imports to spur purchases of American-made goods. However, since all of the USA's trading partners immediatly passed similar laws, our export market dissapeared overnight. International Trade dropped by 50 percent during the crash. The international economic difficulties caused by the Great Depression contributed to the rise of the Nazis in Germany, and compelled Imperial Japan to inveade China for acccess to her markets and resources, so in a way it can be said to have set the stage for WW2. When Word War II began in 1939, US unemployment was 17.2 percent. The US borrowed over $1 billion for war spending; US manufacturing went up by 50 percent between 1939 and 1941. Although, in total, the US increased deficit spending to over 120 percent the gross domestic product (GDP), the end of World War II marked the beginning of the greatest economic boom America had ever experienced, providing the single greatest real-world example of successful Keynesian economics. The US GDP almost doubled from 1940 to 1945 and over 98 percent of the US population was employed, a record that still stands today. The Stock Market Crash of 1929 is reminiscent of the 2007-2009 Recession. In both cases, speculation and an overly optimistic economy lead to over-lending and an ultimate overvaluing of the economy that resulted in a serious downturn. However, what saved 2007 from turning into 1929 was the provisions put in place after the Stock Market Crash that precluded anything of that magnitude happening again. For example, federal legislation began to require that all banks have enough cash to cover all of its deposits. It remains to be seen if the recent reforms will effectively prevent another financial crisis.